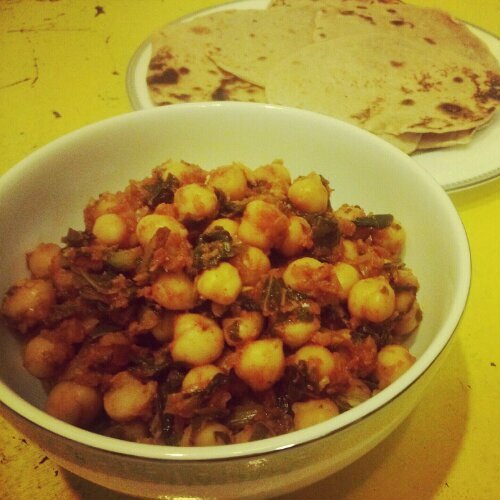 I was having a huge craving for roti bread and channa masala the other day, but didn’t feel like spending any money, so I took a stab at making it at home. I added some collard greens to the channa masala, and it came out okay, but I’ll need to work on that a bit before I post you any recipes. My roti bread, however, came out great! 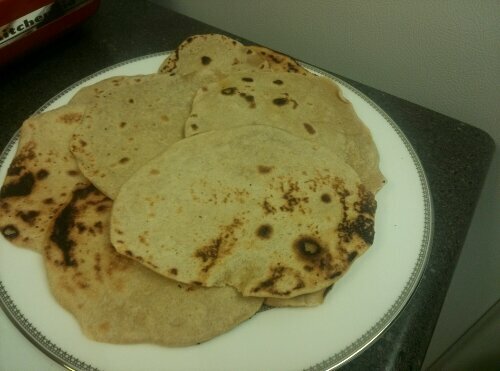 Traditionally roti is made with Atta, a stone ground durum whole wheat flour, but here I used white whole wheat flour with good results. 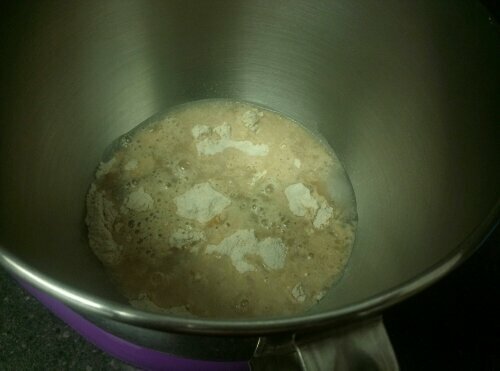 I also decided to use some unrefined coconut oil as an experiment. I figured, if it left a coconuty flavor, it would be a nice complement to the food, but it actually didn’t, so you can use what you like. I used this recipe as my guide. 3. 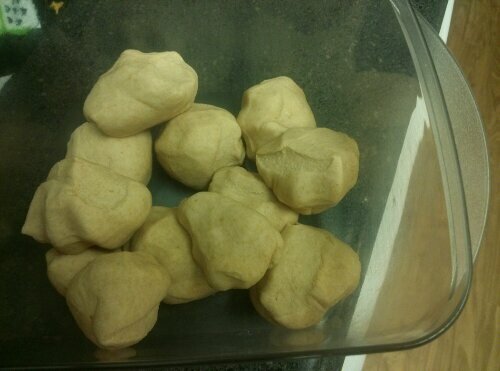 Cut into 12 pieces and shape into dough balls. Use the palms of your hands to shape into a disc and then roll out into thin circles. 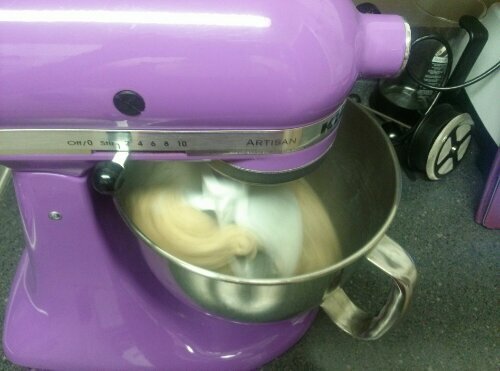 (I no longer have a rolling pin, so I used the sides of my water bottle. 5. Place disc(s) onto skillet and let cook for about a minute, depending on thickness. 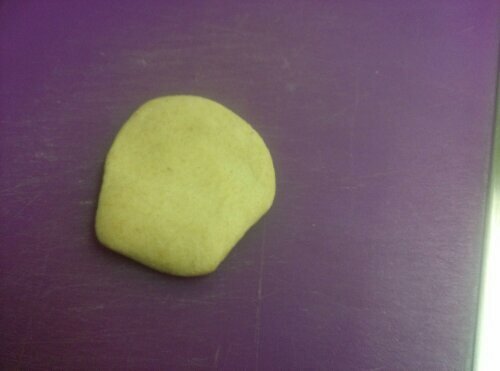 It’s kind of like pancakes, you’ll see the edges change color when it’s ready to turn. Turn to the other side to cook through, about another minute. 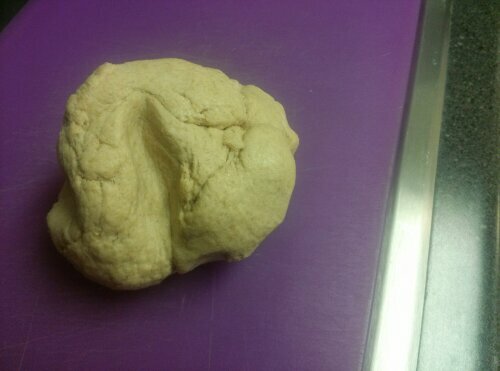 Dough after kneading with dough hook, about 7-10 minutes. Flattened out with palm prior to rolling.